Here you will find links to back issues of 'Balance in Life' your free electronic newsletter. Don't miss out on updates, original articles, a Lighter Note section, poetry . . . The 'Balance in Life' newsletter - your chance to see how 'Boost Your Life - Reinforce Your Self Esteem' works in practice. 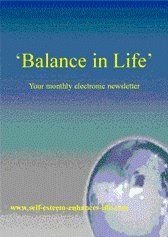 Here is your chance to see the content of issues of 'Balance in Life' - your free email newsletter. It's QUICK and EASY, sign up Here! I promise to use it only to send you Balance in Life. I hope you enjoy the monthly 'Balance in Life' newsletter as much as I enjoy putting it together. This site is for information purposes only. It is not intended to diagnose or treat any medical condition. Please use the information responsibly. If in any doubt consult a qualified medical professional. Copyright© 2008-13. Self-Esteem-Enhances-Life.com. All Rights Reserved. Click on link opens newsletter, click on main article and start reading . . .
Practising Life . . . Set your mind on something . . . Do not (be so quick to) pass the buck Drop your anchors - what life foundations do you have? Losing makes you a better person - how is your self belief? Strive to achieve more in your life Live Life to the full Our values set us apart Keep an open mind Has the genie escaped from the bottle?